Human IL-31 RA, Fc Tag (ILA-H5256) is expressed from human 293 cells (HEK293). It contains AA Ala 20 - Glu 519 (Accession # Q8NI17-1). 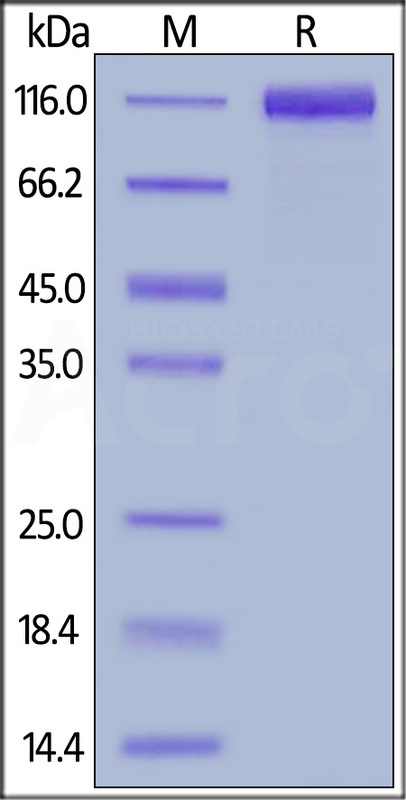 The protein has a calculated MW of 83.5 kDa. The protein migrates as 105-115 kDa under reducing (R) condition (SDS-PAGE) due to glycosylation. Human IL-31 RA, Fc Tag on SDS-PAGE under reducing (R) condition. The gel was stained overnight with Coomassie Blue. The purity of the protein is greater than 95%. Interleukin-31 receptor subunit alpha is a protein that in humans is encoded by the IL31RA gene, also known as IL-31 receptor subunit alpha, IL-31RA, GLM-R, Gp130-like receptor, CRL3, GPL. Oncostatin M receptor (OSMR) and IL31RA form the heterodimeric receptor through which IL31 signals. IL31RA is a strong activator of STAT3 and STAT5, whereas STAT1 is only marginally tyrosine-phosphorylated. dditionally, demonstrate Jak1 binding to GPL and its activation in heteromeric complexes with the OSMRbeta but also in a homomeric receptor complex. (1) Dillon SR. Nat Immunol. 2004 Jul;5(7):752-60. (2) Ghilardi N. J Biol Chem. 2002 May 10;277(19):16831-6. (3) Dreuw A. J Biol Chem. 2004 Aug 20;279(34):36112-20.